Hi, it's been a while. I have been ranting in other venues, and caught up a bit in the All-Trump-All-The-Time phenomena. On Psychology Today's website, I wrote "A simple solution to the bed shortage? Unfortunately, Jail" The link to that is Here. Over on Clinical Psychiatry News, I did a little more research on the topic and spoke with the reporter, one of the doctors, and the Rapid City Sheriff. See "Mentally Ill? Go Directly to Jail"
But I've learned that it's not just in Rapid City, South Dakota where it's an issue -- oh, and the sheriff there is apparently refusing to take these patients -- but other states have these issues as well. My friend, Pete Earley the mental health advocate has been kind enough to share my outrage HERE. 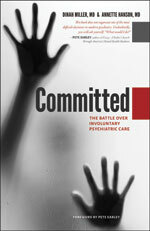 When we submitted our book proposal for Committed, our editor told us we had to take a stance and the message had to be something more than be kind to patients. Lately, I'm thinking that "Be kind to patients" is not such an obvious thing in our crazy world. Last week, I wrote an article about a hospital in Rapid City SD that announced their overflow psychiatry patients would be held in jail (--I researched the article after I first saw it on this FB page, so thank you to the poster). Today I read that in 6 states people in mental health crises can be (and are) held in jail when there are no hospital beds available. These are not people who have committed a crime. Why, as a society, don't we think this is unconscionable? Could you imagine going to the hospital for pneumonia, being told there were no beds so you were going to jail? Why is jail ever an alternative to health care? What is wrong with us? Mostly I've been surprised at how little outrage there is, though I hear the APA is now writing an action paper to oppose jailing psych patients. Will that help? Does anyone read APA action papers? Commenters say, well, most mental health care is given in jail (and, sigh, we seem to accept that as okay), but this is different: these are not people who've committed a crime, these are patients going to an ER for help! They haven't broken a law, they aren't under arrest. Advocates want to increase laws to make it easier to force care, how about making it easier to access care in a humane and kind way?